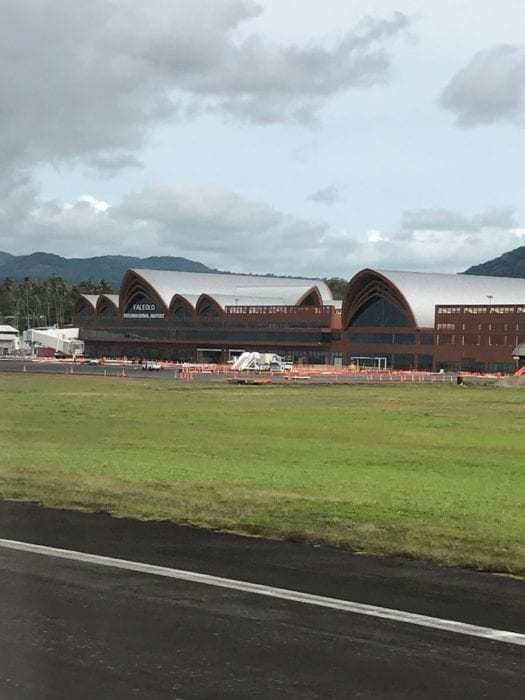 After spending three weeks in Fiji, I suddenly had to relocate to Apia, Samoa. My options were pretty limited. 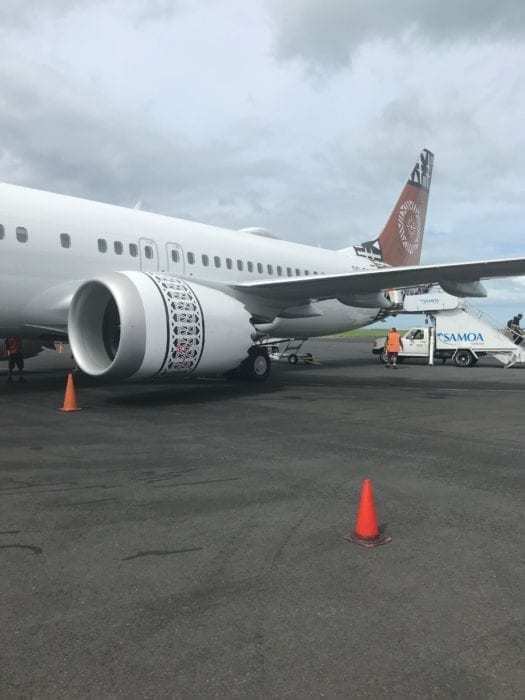 Fiji Airways operated a direct flight from Nadi to Samoa on a 737 MAX. My other option was to connect in Auckland. 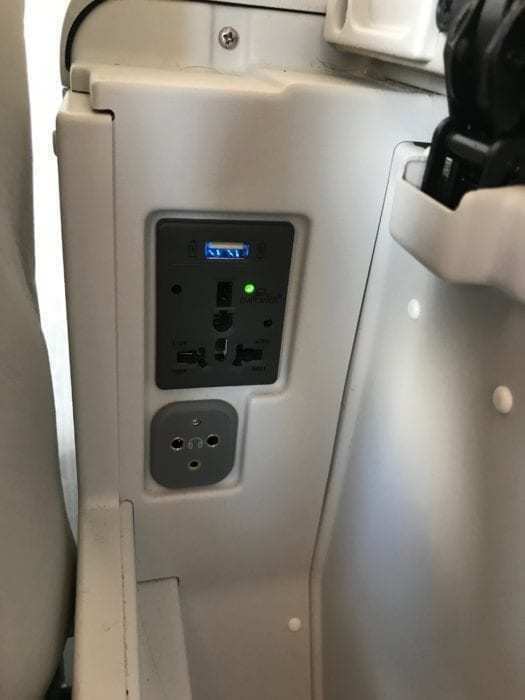 The organization I was working with paid for my flight and they went with the direct Fiji Airways in Business Class on the new 737 Max. Needless to say…..I WAS VERY EXCITED! 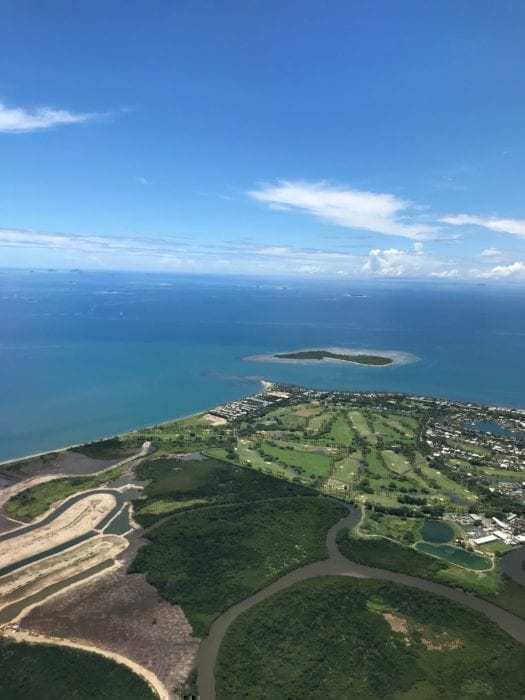 We’ve written about the 737 MAX 8 in Fiji Airways, but to be on one was an incredible experience. These island flights are expensive. You can expect to part with around $400 for a roundtrip on this two-hour flight from Nadi to Samoa in economy. For business, the cost was almost $900. This is definitely not a good deal. I would never have paid cash for this flight if I was booking it myself. Instead, I would look for partners. 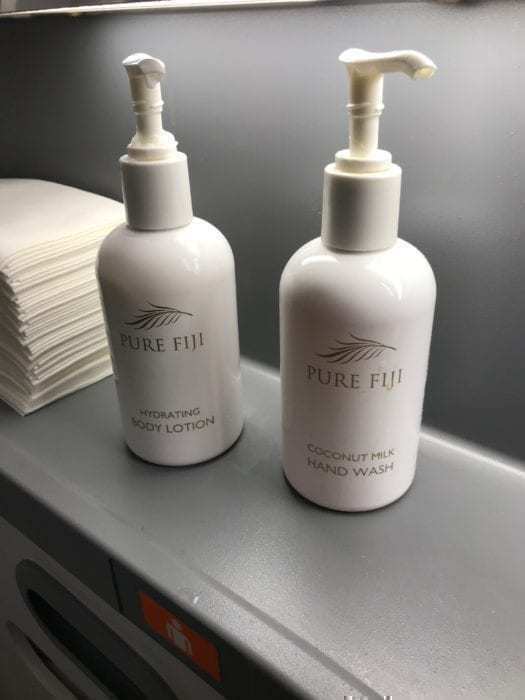 Fiji Airways is a Oneworld Connect partner, but I’m still not entirely sure what that means. My go-to for miles would have been American Airlines. Then again, I wasn’t paying and I decided to credit my miles to American. At the time of writing, my miles hadn’t posted. 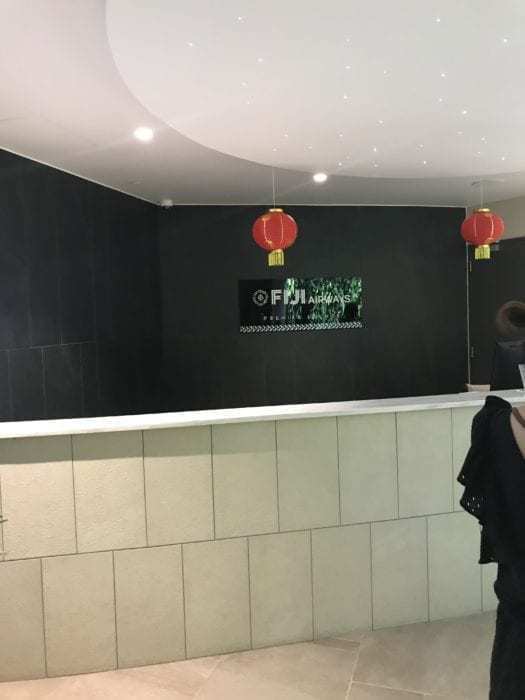 Fiji Airways had a dedicated check-in area at the Nadi Airport for Business Class passengers. Since I was traveling for four months, I had a fair bit of luggage with me. Also accompanying me were some excellent friends I had made in Fiji. All in all, 6 of us approached the Fiji Airways check-in desk to drop off my luggage. The agent asked me how many passengers were traveling and I said: “Just myself. The others are my bodyguards.” She either didn’t pick up that I was making a joke or she didn’t care because she showed no visible reaction. It made for an awkward moment and my friends and I just shared cringey looks. 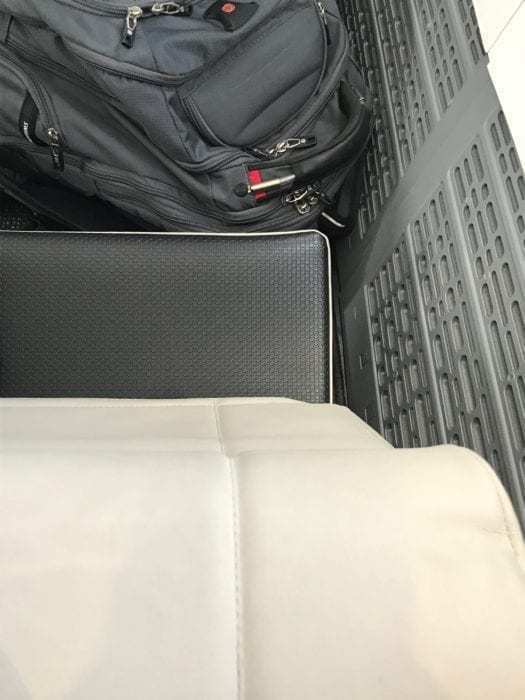 With other airlines, when I check in for a premium class flight (even in Premium Economy), I had been thanked for flying in their premium cabin. Not here. The gate agent seemed intent on just doing her job. She was efficient but cold and not personable. This definitely did not match the vibe I got from everyone else I met in Fiji. The airport itself is relatively small and I enjoyed one last coffee with my friends before we departed. 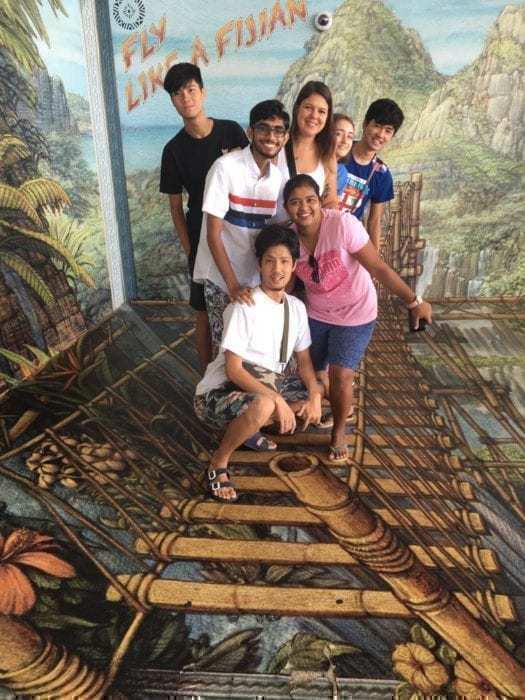 It’s worth noting that the airport had a very “Fijian” place to take photographs. I cleared security and immigration, which took about 10 minutes, and made my way to the lounge. The lounges are not in the best place for an airport. 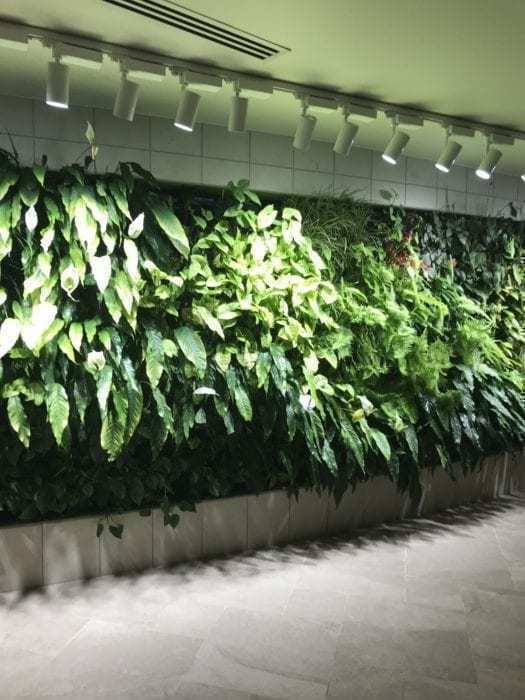 I had to take a nondescript elevator down one floor, sneak through a narrow hallway, and I found myself staring at a bit of a jungle wall. 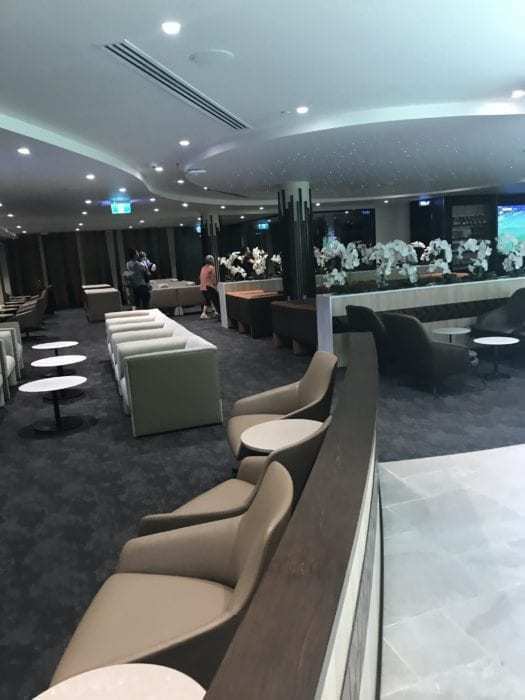 This lounge is accessible by a lot of premium passengers on different airlines and Priority Pass members. I got access through my business class ticket. I think they were trying to go for a Chinese New Year theme with the lanterns? The lady at the desk examined my boarding pass, checked off my name on a list, and let me enter the lounge. After entering, I was greeted with more jungle. 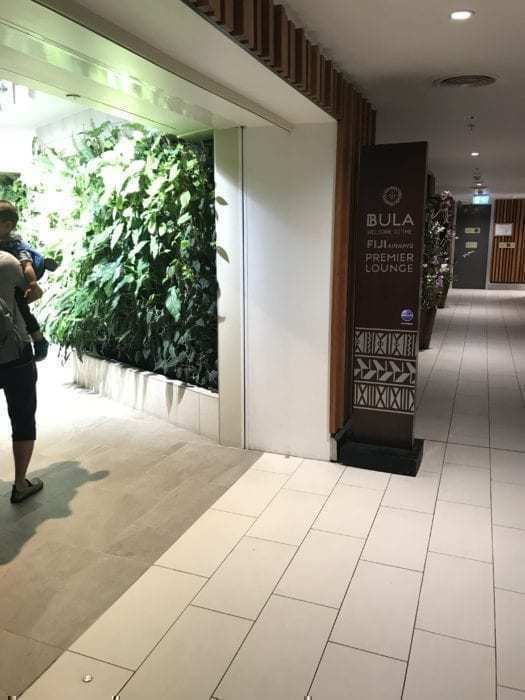 Was this a premium lounge or a Rainforest Cafe? The lounge itself was nicely polished and quite big. 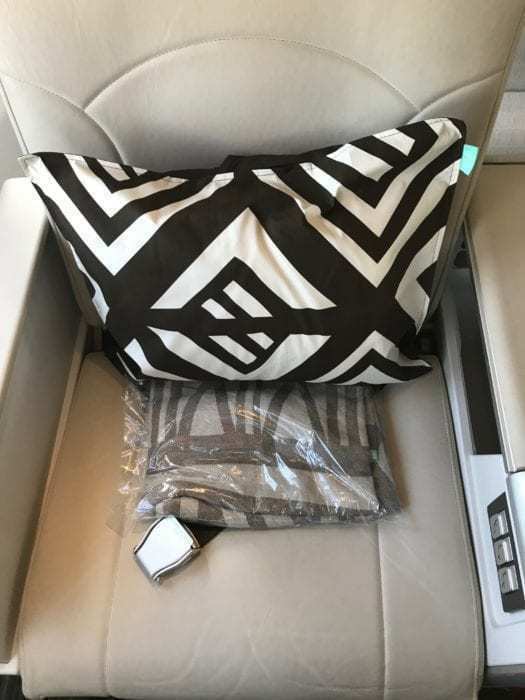 The finishes were a continuation of the finishes you’ll find in a Fiji Airways cabin. The lounge had free wifi which was decent and I could make some wifi-based phone calls. After doing some work, I decided to try some of the food options. I arrived as they were transitioning from serving breakfast options to lunch options. The food area was a bit chaotic and I didn’t take any pictures because I was a bit overwhelmed by the number of people running around. 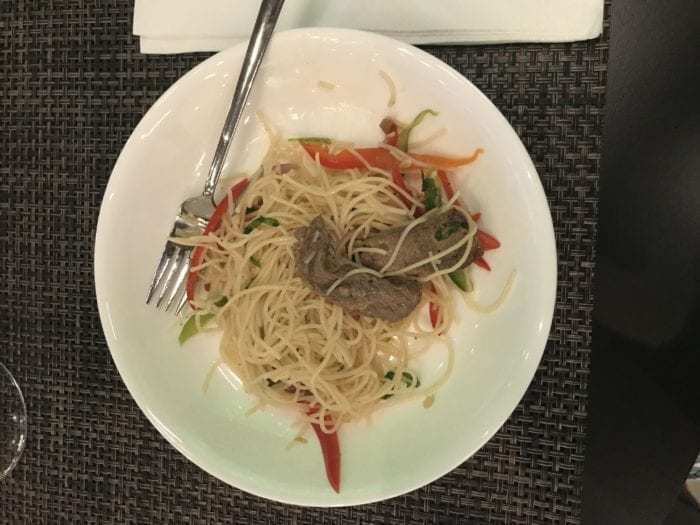 Eventually, one of the managers came up to me and asked me if I would like some Thai Beef Salad, which I agreed to because I didn’t want to wait for more chaos to ensue. The salad was nothing special and it wasn’t very filling. It made for a good snack. During my meal, I examined some of the lounge activities. There was one thing that bothered me. The staff were very attentive….for passengers who looked like they were not locals. A few locals were seated around me as was a British couple. The non-local passengers were served drinks at their seats, their tables were promptly cleared, and they were offered more food. I, and the locals around me, got none of that treatment. I kept nudging my empty plate away from me in hope of a staff member to pick it up. It was in vain and I eventually just walked my plate up to the counter. The head manager was working the counter and gave no indication that I had delivered my plate myself. Oh well. I made my way back through the alley to the gate for boarding. I got to the gate and there was an aircraft sitting there, but there was no staff. It seems the inbound was delayed and the flight we were on was delayed, but there was no information presented to passengers. We were scheduled to board at 11:30 for our 12:15 departure. Boarding did not start until 12:00. In the end, we were delayed by about 15-20 minutes. Boarding wasn’t really announced. Instead, I saw that people were moving through a line at the gate. The closest thing to an announcement was a lady who was screaming “BUSINESS AND ELITES” I walked up to her, presented my boarding pass, and without looking at it she said to me: “This is for Business Class passengers.” I pointed to the word “BUSINESS” stamped on my ticket and she let me move on. When another agent scanned my boarding pass, she made a bit of an uproar. It seems like the agent at check-in attached my luggage tag to the stub she had to retain. When she retained the stub, I asked about my luggage tag. She sighed and made a sound like “ugh” before saying, “Next time get your boarding pass properly” and wrote out both numbers on the back of the ticket. Geez louise. The airport staff for Fiji Airways just wasn’t a good crew of people. Not exceptional and not warm. This definitely was not very Fijian. This is where I really started to feel the Fijian nature. I was greeted by a British flight attendant with an enthusiastic “Bula!” when she noticed I was traveling in Business Class. She directed me to my seat 2F in the last row of business class on the right side of the plane. The cabin was absolutely beautiful! The finishes were tip top and the plane was in immaculate condition. It even had that new plane smell. Business class is arranged in two rows of a 2-2 configuration for an 8-seat cabin. It is a very intimate configuration and it was made better by the fact that we had two flight attendants servicing us. One in the aisle and one in the galley. I made it to my seat and found a nice pillow and blanket waiting for me. These were the only amenities offered on the flight but were more than enough for a two-hour hop. In fact, the blanket was similar to what I’d expect to receive on a long-haul flight in business class. It was heavy. 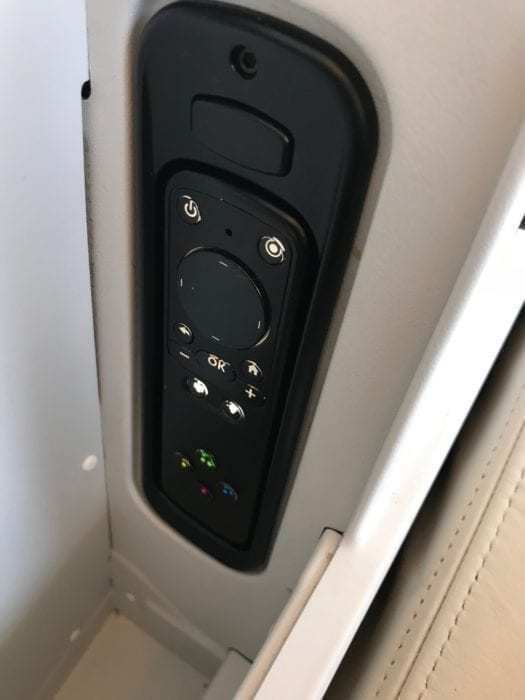 There were seat controls on the left armrest in addition to a universal outlet, headphone jack, and remote control within a little nook. The remote control was necessary because the screen was quite far away! You could really feel those 51 inches of pitch! 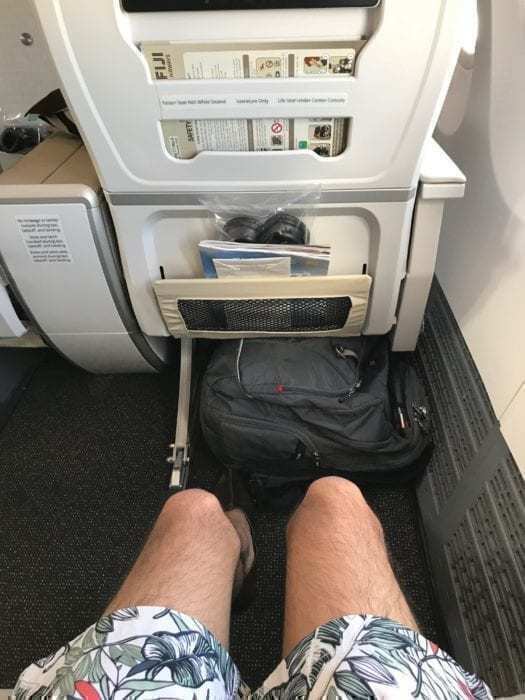 I’m 5’8″ and the legroom was more than enough for a short, or even longer, flight. There was also a legrest and footrest which could be adjusted based on your preferences. It is worth noting that this is the exact same seat I had on my Premium Select flight with Delta a couple months ago. However, the remote control was in a much better location and there was far more pitch. After settling in, I was offered a water bottle. 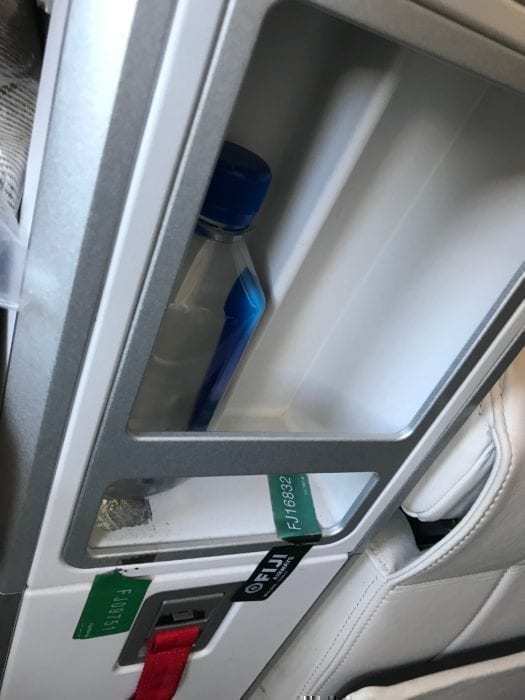 There was a handy little storage area for the water bottle in the main armrest. 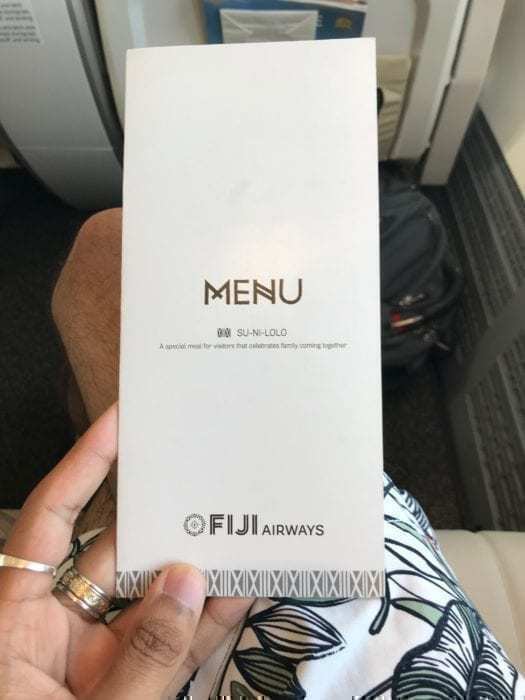 Of course, Fiji Airways served Fiji Water. 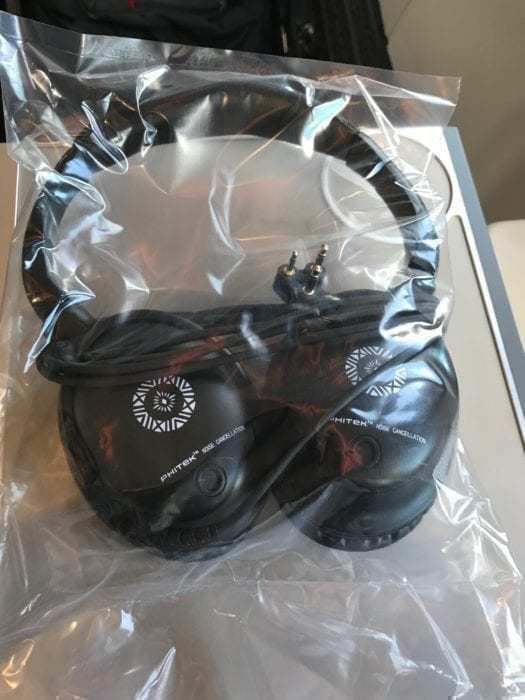 I was also presented with a pair of headphones which were noise canceling. They were comfortable and did the job well. I barely heard any noise during the flight outside of the entertainment I was watching. The monitors were 13-inch and crisp, clear, and easy to use. They were very modern and had more than enough films and TV shows to last a 4-5 hour flight let alone a 2-hour hop. 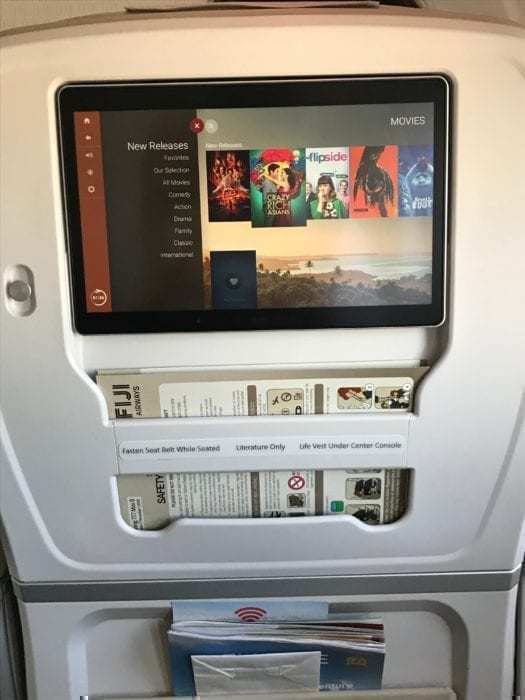 Fiji Airways does not have a safety video. Instead, flight attendants performed a manual safety briefing in the aisles. There was one lavatory available for Business Class at the front of the plane. 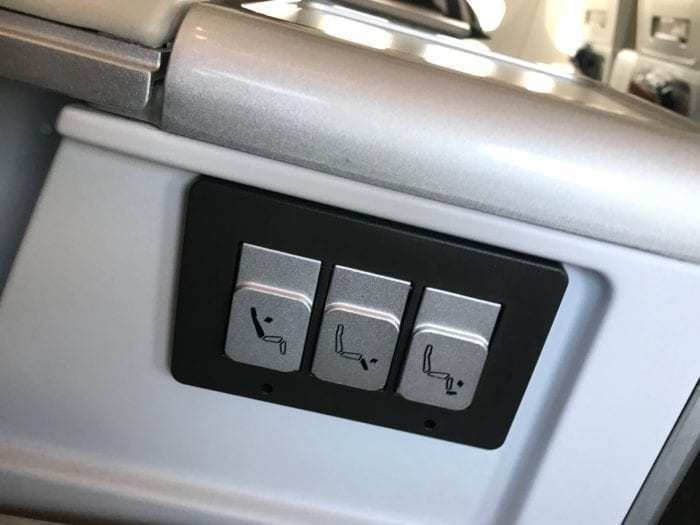 As is the norm with the 737 MAX, the lavatory was tight. There were, however, some Fijian amenities. Shortly after boarding, I was presented with a menu and a pre-departure beverage. I was offered apple juice in a proper glass. I love when pre-departure beverages are served in proper glassware. They make the experience so much better. 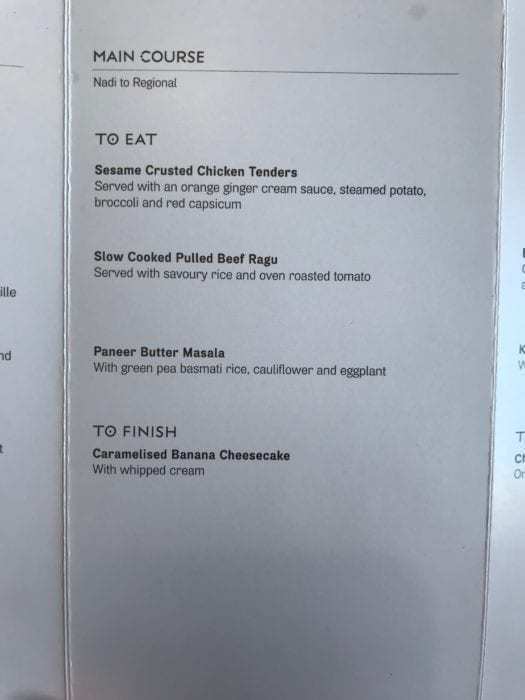 After enjoying the juice, I examined the lunch menu for the flight. While collecting my glass, the flight attendant took my meal order. 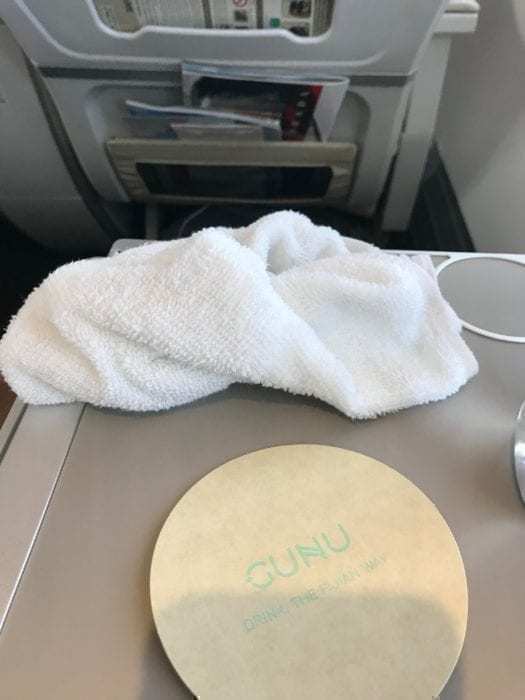 Five minutes after takeoff, I was presented with a cold towel, a beverage and within ten minutes after that, my meal was served on one tray. I received a glass of champagne to accompany my Sesame Crusted Chicken Tenders. 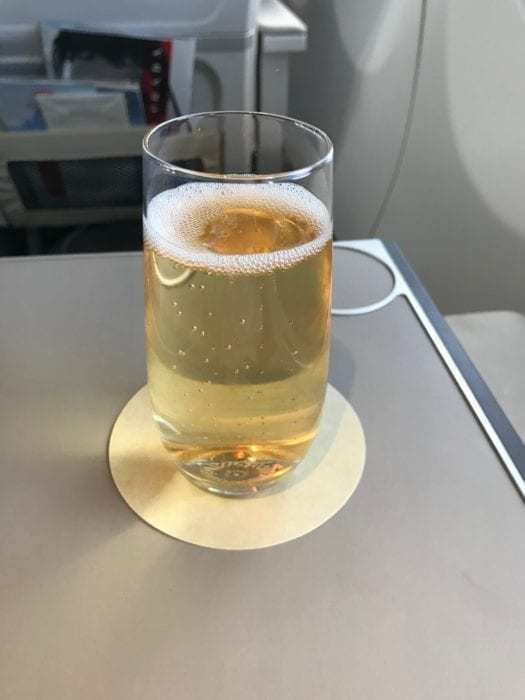 I’m not sure what champagne Fiji Airways serves, but it was not bad, perfectly drinkable. The chicken was served warm and was delectable. The bread was the perfect accompaniment. 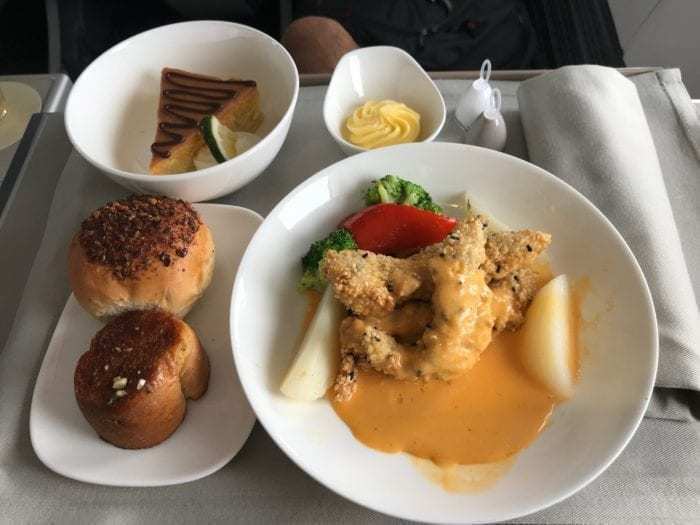 Given the short duration of the flight, there was no appetizer but the meal was very filling. The cheesecake was also fantastic. This was easily the best meal I’d ever had on a plane. While not entirely Fijian, it did the job and was very satisfying. By the team I had finished my meal, we were about 30 minutes out from Samoa. The crew cleared my tray and offered me a warm towel. The towels were thick and nice. 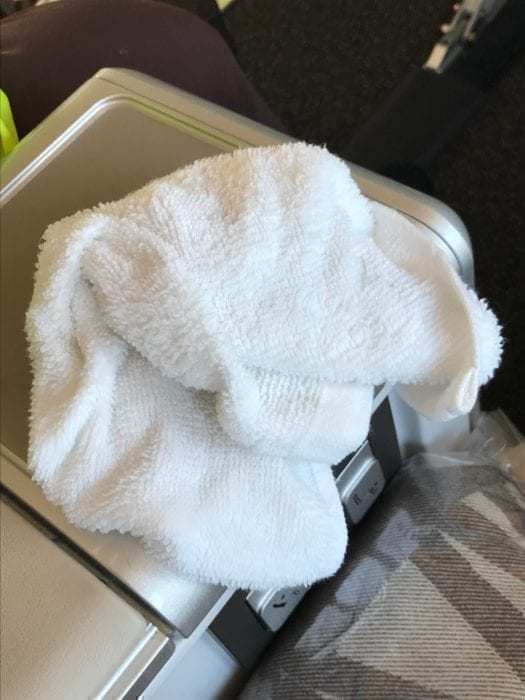 I appreciate when an airline uses real towels in business class. It’s a nice touch. The cabin crew was fantastic and the most welcoming of all the Fiji Airways employees I interacted with. They were on top of the service and addressed me politely. They made me feel welcome and were very helpful. The cabin crew also really emphasized “Fiji Time” It took me a while to realize they were referring to their inflight magazine and not the general sense of delayed-ness that is popularized in Fiji. I decided to include some additional photos I took after takeoff and landing. The scenery was fantastic! We disembarked using stairs and I got a view of our fantastic new aircraft. 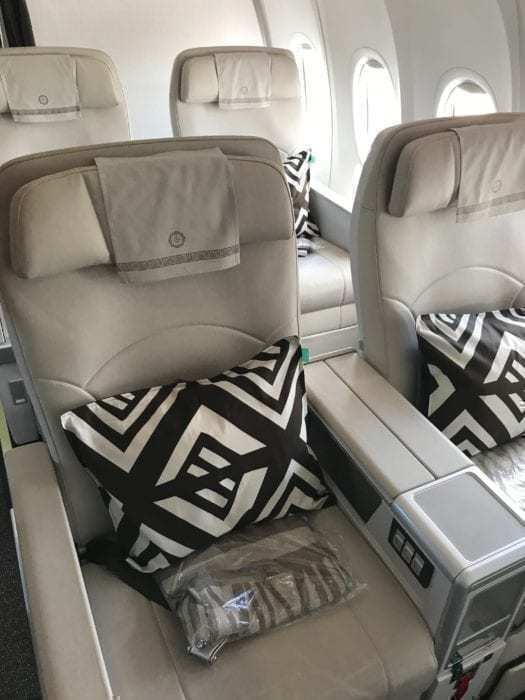 I would recommend Fiji Airways Business Class and their 737 MAX 8 on any flights you have to take with them. The cabin is wonderful and the service is incredible. That being said, I think that the ground staff at Nadi (which is their hub) could use some refinement and the service could be better. I also think that the pricing is higher than I’d be willing to spend for a cash flight. However, your options of getting to Samoa are pretty limited if you’re flying out of Fiji. For this route, I’d definitely look into getting a ticket on miles through a partner. 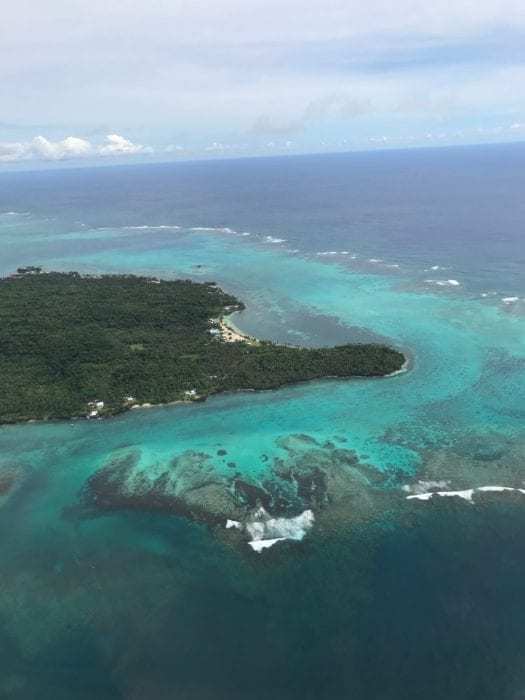 Have you flown Fiji Airways before? What was your experience like? 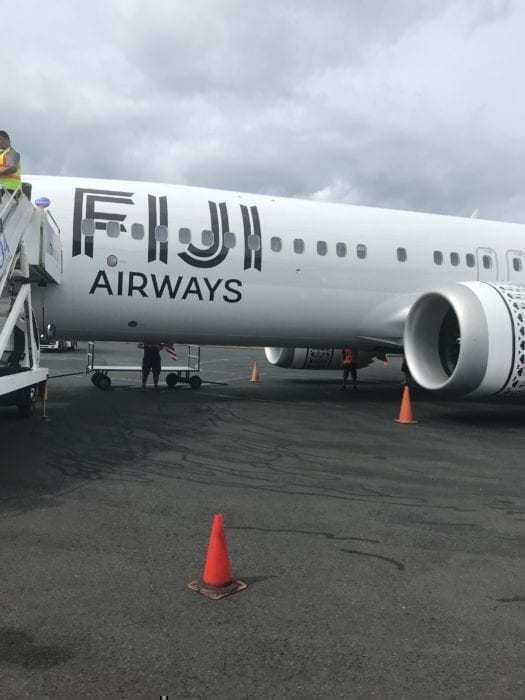 Would you fly Fiji Airways on their 737 MAX? Let us know in the comments! Which brands of Champagne would you consider to be undrinkable?